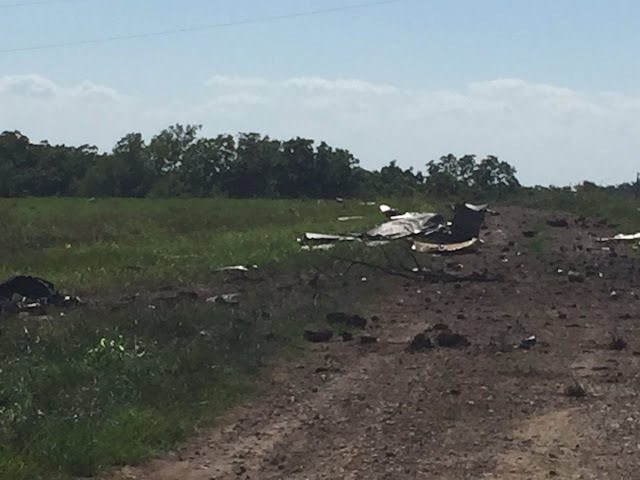 On July 16, 2017, about 1018 central daylight time, a North American Aero Classics P-51-D airplane, N251PW, was destroyed when it impacted trees and the ground 2.5 miles northeast of Cummings, Kansas. 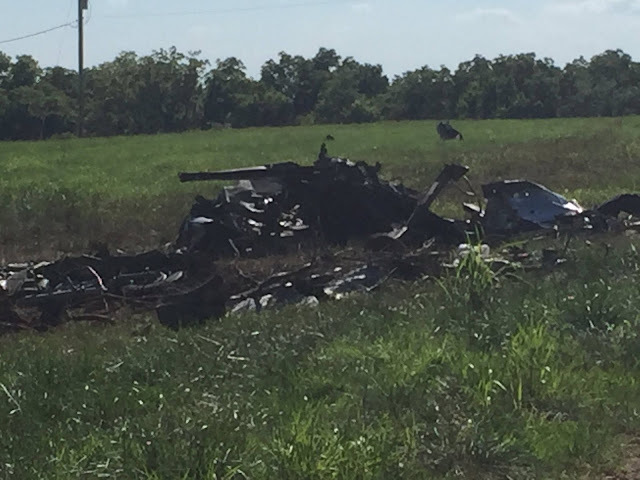 The airline transport pilot and the commercial pilot-certificated passenger were fatally injured. 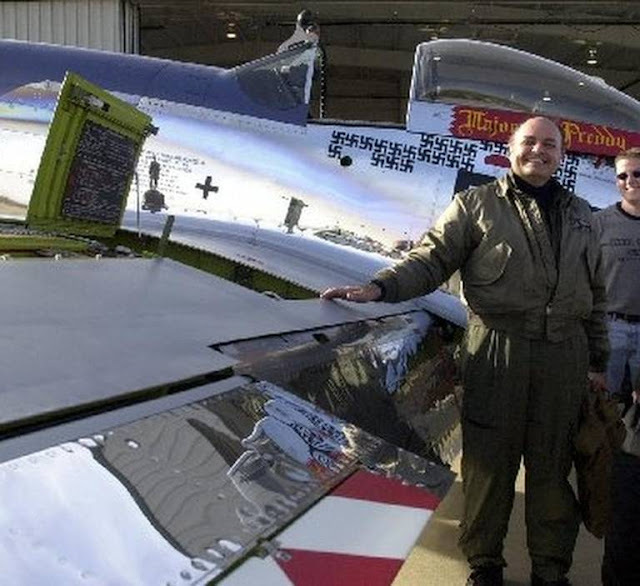 The airplane was owned by Mustang Historic Military Aircraft, LLC., and it was operated by the pilot under the provisions of Title 14 Code of Federal Regulations Part 91. Visual meteorological conditions prevailed and no Federal Aviation Administration (FAA) flight plan had been filed for the flight. The local personal flight departed Amelia Earhart Airport (K59), Atchison, Kansas, about 1005. According to several witnesses located between K59 and the accident site, the airplane performed aerobatics in the area south of the airport. A witness located several hundred feet from the accident location observed the airplane fly over nearby power lines between 25 ft and 30 ft above the ground. The airplane then pitched up to climb in a near vertical attitude, the nose of the airplane turned to the left, the airplane turned left and then pitched down in a nose-low attitude. The airplane descended towards the ground and just before impact the tail of the airplane came up. The airplane impacted the ground in a near vertical attitude. 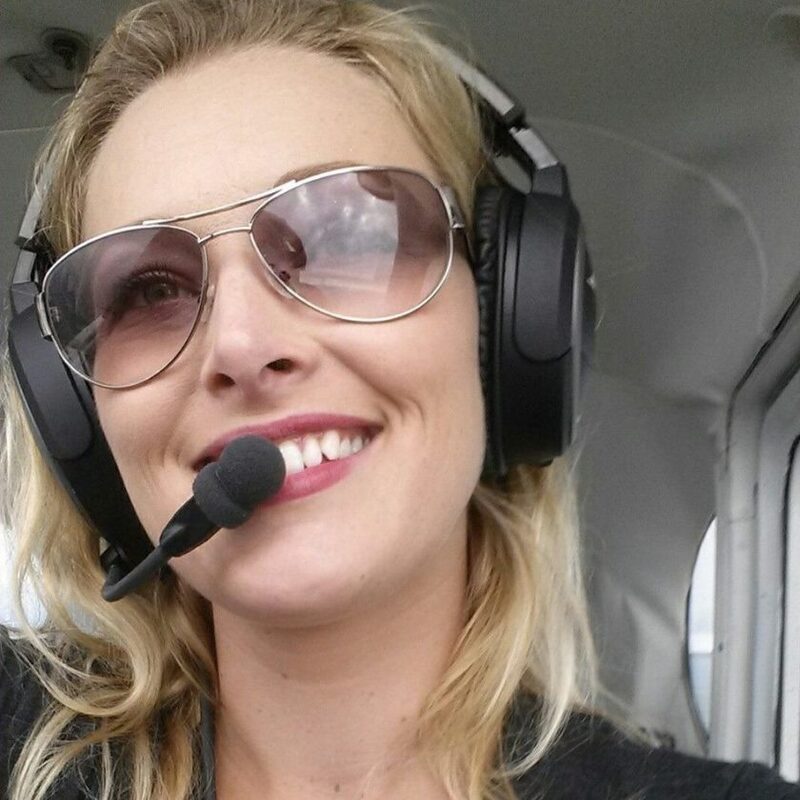 When the witness heard the airplane flying overhead, he initially thought it was the pilot-certificated passenger flying an agricultural airplane, as she routinely flew over that area in the same manner during agricultural operations. Radar data, provided by the FAA in National Track Analysis Program (NTAP) format, identified and depicted the accident flight from shortly after departure at 1009:41 until the time of the accident. The airplane initially climbed to 2,000 ft mean sea level (msl); the altitude varied between 2,100 ft and 4,400 ft msl. During the last 30 seconds of the flight, the altitude was about 2,500 ft at 1018:04, increased to 2,700 ft at 1018:08, decreased to 2,500 ft at 1018:22, and continued to decrease to 1,600 ft at 1018:27. The last radar target was located 250 ft to the northeast of the initial impact point. The pilot's most recent second-class airman medical certificate contained the limitations "Holder shall possess glasses for near/intermediate vision. Not valid for any class after 05/31/2018." 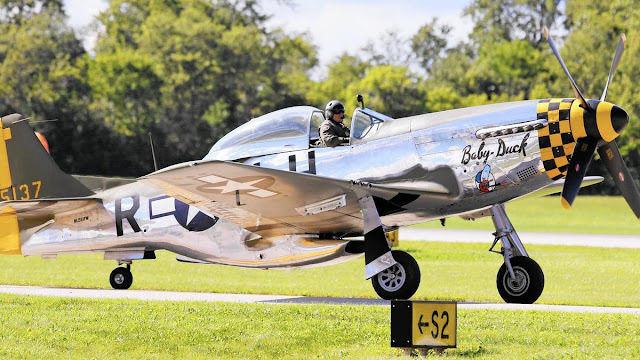 The pilot held a FAA Statement of Aerobatic Competency for four different warbird airplanes including the P-51. 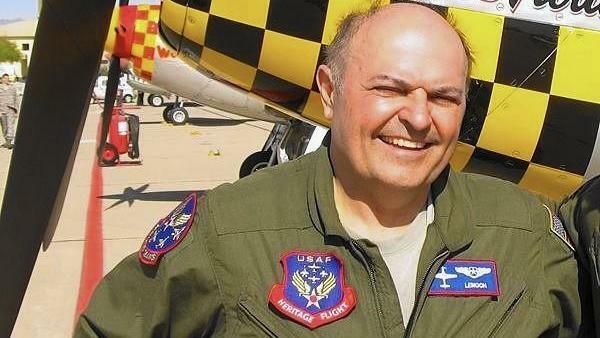 His altitude level was "Level 1: Unrestricted" and he held endorsements for solo and formation aerobatics. His endorsement expired in October 2019. 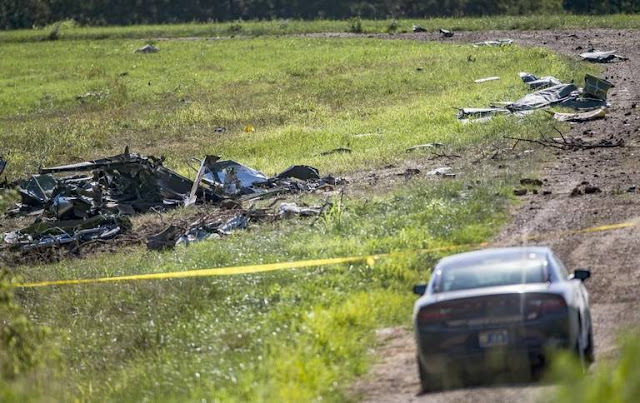 According to the pilot's family, he had been flying the make and model of the accident airplane for over 20 years. The pilot-certificated passenger's most recent second-class airman medical certificate contained the limitations "must wear corrective lenses." On the application for this certificate, she estimated her total flight time as 2,000 hours; of which 600 hours had been logged in the past 6 months. 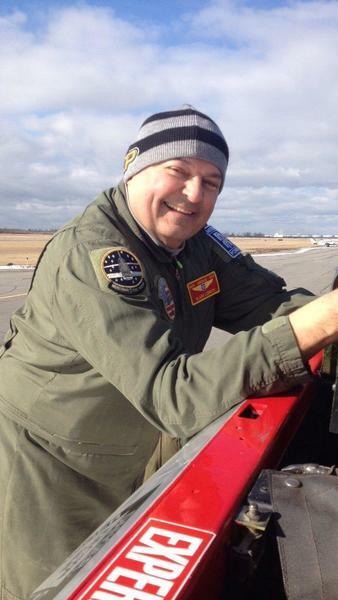 The pilot-certificated passenger was the airport manager at K59 and was employed by McElwain Aerial Spraying as an agriculture pilot. She did not have any flight time or experience in the accident airplane make and model. The North American P-51-D Mustang is a low-wing, single seat, single engine, propeller driven airplane originally designed and built as a long-range fighter for the military and used during World War II and the Korean War. The accident airplane, Serial Number (S/N) 44-72086, was delivered to the Army Air Forces on January 20, 1945. The airplane was acquired by the current owner in 1996 and restored to an airworthy condition in 2011. The airplane was painted in the markings of Capt. Herbert G. Kolb's "Baby Duck" from the U.S. Army 8th Air Force, 353rd Fighter Group, 350th Fighter Squadron. The airplane was modified by the addition of a second seat aft of the standard single pilot seat. According to the airplane maintenance records, the aft seat was equipped with a second set of flight controls that were installed in 1968. The controls consisted of a control stick, rudder pedals without brake inputs, throttle lever, and a limited set of flight instruments. There were no trim controls, landing gear controls, or radios in the aft compartment. The North American P-51D Mustang “Baby Duck” flown by Vlado Lenoch during the Wings Over Waukegan Northern Illinois Airshow in 2016. Lenoch was killed July 16, 2017 when the Mustang crashed in Kansas. 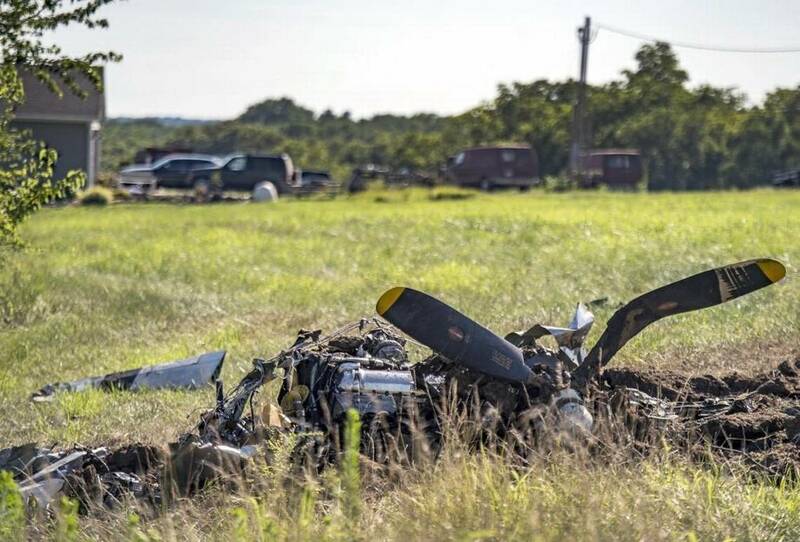 The accident site was located in rolling terrain at an elevation of 1,050 ft msl and the airplane impacted the ground on a magnetic heading of 259°. Several branches were separated from a tree and the angle of damage through the tree was estimated at 60°. A long and narrow ground scar, oriented perpendicular to the debris path, was located just forward of the tree and contained the pitot tube from the wing. A large crater contained bent and torn metal, the engine, gearbox, and propeller assembly. The empennage and fragmented pieces of the fuselage were located 25 ft northwest of the propeller assembly. 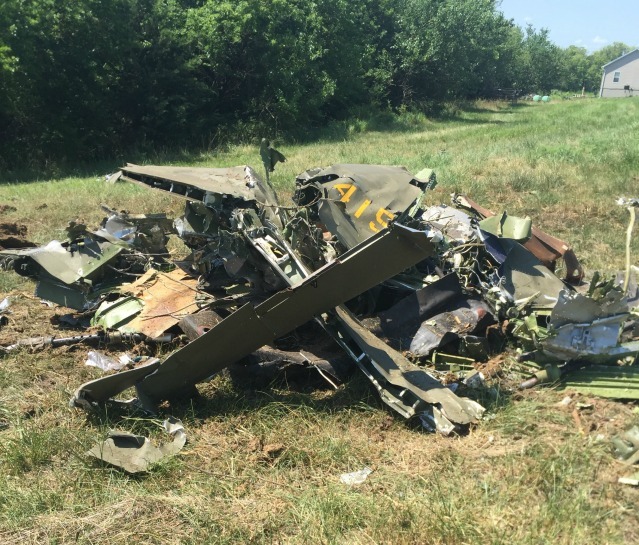 Fragmented pieces of both wings, the rudder, elevator, and the fuselage were scattered in the debris field that extended over 450 ft from the initial impact point. The cockpit instruments had separated from their cockpit locations and did not convey reliable readings. All the major portions of the airplane were accounted for on scene. The Forensic Medical Morgue of Kansas City, Kansas, performed the autopsy on the pilot on July 17, 2017, as authorized by the Atchison County Coroner's office. The autopsy concluded that the cause of death was "blunt traumatic injuries sustained in a plane crash" and the report listed the specific injuries. The autopsy was limited by the severity of trauma but revealed coronary artery disease described as "mild" and focal hypertrophic cardiac myocytes and a focal healed endomyocardial scar by microscopy. The pilot had longstanding diabetes, hypertension, and high cholesterol, which were controlled with medications. He had reported these conditions and their treatment to the FAA. The FAA Bioaeronautical Sciences Research Laboratory, Oklahoma City, Oklahoma, performed toxicological tests on specimens that were collected during the pilot's autopsy. Tests of the tissue revealed 54 mg/dL ethanol in the liver, 10 mg/dL ethanol in muscle, atorvastatin in the lung and liver, and losartan in the liver. Putrefaction was present in the samples. Atorvastatin and losartan do not cause impairment or incapacitation. When ethanol is ingested, it is quickly distributed throughout the body's tissues and fluids fairly uniformly. Ethanol may also be produced in the body after death by microbial activity. The Forensic Medical Morgue of Kansas City, Kansas, performed the autopsy on the pilot-certificated passenger on July 17, 2017, as authorized by the Atchison County Coroner's office. The autopsy concluded that the cause of death was "blunt traumatic injuries sustained in a plane crash" and the report listed the specific injuries. No significant natural disease was identified. The FAA Bioaeronautical Sciences Research Laboratory, Oklahoma City, Oklahoma, performed toxicological tests on specimens that were collected during the pilot-certificated passenger's autopsy. Results were negative for carbon monoxide and tested drugs. Tests of the blood revealed 36 mg/dL ethanol. Putrefaction was present in the samples. 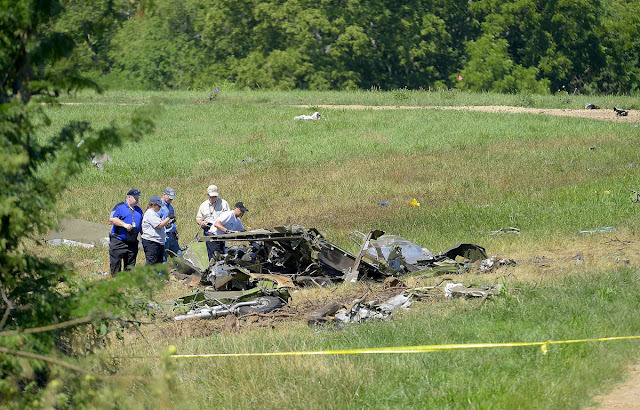 The wreckage of the airplane was recovered to a secured facility for further examination. The forward and aft flight control components were reconstructed to ascertain continuity. The controls were deformed, fractured, and separated in numerous places, and all fractures had a dull, grainy appearance consistent with overstress separation. The empennage wreckage consisted of the left and right horizontal stabilizers, elevator, vertical stabilizer, and aft fuselage. There was significant impact damage and deformation. The propeller separated from the engine at the reduction gear box and one propeller blade fractured at the hub flange. All four propeller blades exhibited leading edge damage and chordwise scratching on the camber sides. The blower assembly separated from the aft end of the engine. The first stage impeller blades in the blower were all bent clockwise, opposite the direction of rotation. For a detailed description of the wreckage examination see the Airworthiness Group Chairman's factual report available in the public docket for this accident. The accident airplane was owned by Historic Military Aircraft, LLC, and was operated by the Warbird Heritage Foundation. The pilot was hired through Dacy Airshows to perform in an airshow; part of the Amelia Earhart Festival which took place the day before the accident. The pilot-certificated passenger approached the pilot on the evening before the accident and queried about a flight in the airplane. It was agreed that they would fly together before he departed the next day. One witness stated that he was not aware of any agreement for the pilot-certificated passenger to manipulate the flight controls. The pilot-certificated passenger was seated in the back seat and had access to the flight controls; however, investigators were not able to determine who was manipulating the flight controls just before or at the time of the accident. On July 16, 2017, about 1020 central daylight time, a North American Aero Classics P-51 D airplane, N251PW, was destroyed when it impacted trees and terrain 2.5 miles northeast of Cummings, Kansas. The airline transport pilot and passenger were fatally injured. The airplane was destroyed. The personal flight was conducted under the provisions of 14 Code of Federal Regulations Part 91. Visual meteorological conditions prevailed and no Federal Aviation Administration (FAA) flight plan had been filed for the flight. The local flight departed the Amelia Earhart Airport (K59), Atchison, Kansas, about 1005. According to several witnesses located between K59 and the accident site, the airplane was observed performing aerobatics at a high altitude. A witness, located further to the south of K59, and several hundred feet from the accident location, observed the airplane fly over nearby power lines between 25 ft and 30 ft above the ground. The airplane pitched up to climb in a near vertical attitude and then the nose turned to the left and the airplane turned and pitched down in a nose low attitude. The airplane descended towards terrain and just prior to impacting the ground the tail of the airplane came up. 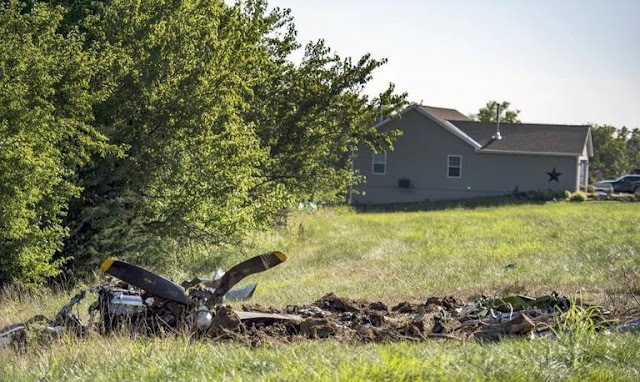 The airplane impacted the ground just short of a grove of trees. A large crater marked the initial ground impact point and contained bent and torn metal, the engine, transmission, and propeller assembly. The empennage and fragmented pieces of the fuselage were located 25 feet northwest of the propeller assembly. Fragmented pieces of both wings, the rudder, and the fuselage were scattered in the debris field that extended over 400 feet from the initial impact point. The closest official weather observation station was located 25 miles northeast of the accident site near St. Joseph, Missouri. The weather observation taken at 1053 recorded the wind at 230° at 4 knots, visibility 10 statute miles, sky condition clear of clouds, temperature 29° Celsius (C), dewpoint temperature 24° C, and an altimeter setting of 30.06 inches of Mercury.